I'm new to your website. A friend said you have a recipe for some sort of egg scramble that can be made in the microwave. I love that idea! Can you tell me more? What else can I cook in the microwave? Welcome! Egg-mug recipes are a staple in the world of Hungry Girl. They cook up super fast, and there's no skillet to clean afterward! There are actually several things you can make in the microwave. Here are six of my favorites… All of 'em are quick, easy, and perfectly portion controlled! This recipe is one of the most popular HG egg mugs. The feta and basil bring so much flavor. 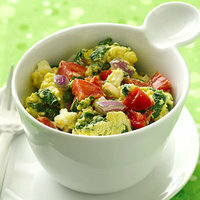 The great thing about egg mugs is that you can easily customize 'em with whatever veggies and cheese you have on hand. But if you don't feel like experimenting, here are some more egg-mug recipes to choose from. Yum! 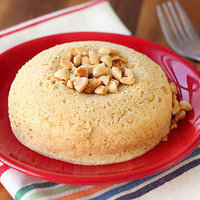 A muffin isn't the only sweet breakfast treat you can cook in the microwave. 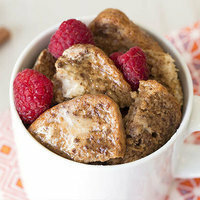 This French toast tastes amazing, and it couldn't be easier to make. It's got lots of protein and fiber to help fuel your day. But it's not just for mornings... It makes an excellent snack or dessert as well! 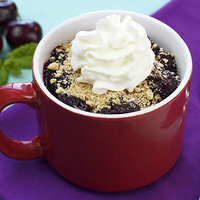 Another beloved baked dessert gets an HG makeover in the microwave! This one's made with frozen cherries, a great staple to keep in your freezer. (Sometimes, I eat them frozen. Shhh!) Add a few pantry essentials, and you've got a personal pie in a matter of minutes. 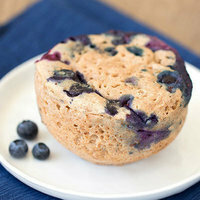 This recipe works great with blueberries and mixed fruit too. And if apple pie is your weakness, you need this recipe for Red Hot Apple Pie in a Cup. Last but not least, my take on a comfort-food classic: bread pudding. 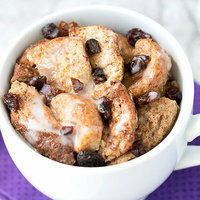 Packed with cinnamon-raisin goodness, it even has a sweet and gooey glaze on top. I'm getting hungry just thinking about it... This one's a must-try! And for a chocolate-banana spin, click right here. It’s April 11th, National Pet Day! Snuggle up with your furbabies, and say hello to Lolly on Facebook! You're not the only one who could use made-in-the-microwave recipes! Click "Send to a Friend" now to share this valuable info.